This is without a doubt one of the very best mid-range recumbent bikes that you can go with. It has a whole lot of resistance levels, many workout programs, it is extremely durable, and very comfortable too. All in all, while it is a little bit on the pricey side of the mid-range models, it is absolutely worth the investment. If you would like to watch a little video overview of what the Exerpeutic 4000 Magnetic Recumbent Bike is all about, you can check out the video below. The Exerpeutic 4000 Magnetic Recumbent Bike does have quite a bit of features that you will like, so what are they? In terms of the size and weight of the Exerpeutic 4000 Magnetic Recumbent Bike, it is about average for a mid-range recumbent bike. It is not the biggest ever machine, but it is not exactly a space saver either. Its fairly high weight does make it a little hard to transport, but it does come with transportation wheels to help make life a little bit easier. The Exerpeutic 4000 Magnetic Recumbent Bike does not come with the best warranty, which is somewhat disappointing considering that this is a fairly pricey item. The Exerpeutic 4000 Magnetic Recumbent Bike only comes with a 1-year limited warranty. The assembly process for the Exerpeutic 4000 Magnetic Recumbent Bike is not very difficult at all. All of the tools and required parts come included in the package, plus the instructions are extremely easy to follow. It is not the smallest piece of equipment, so you may want to have someone helping you with the assembly. That being said, it should take one person no longer than two hours to complete the job. You can always choose to get expert in-home assembly for an additional fee. Here is a link to the assembly instructions for this manual. There are a few specific things that we really like about the Exerpeutic 4000 Magnetic Recumbent Bike, so let’s talk about those right now. The first thing that we really like about the Exerpeutic 4000 Magnetic Recumbent Bike is that it comes with a full 24 levels of magnetic resistance. That is more resistance levels than any other mid-range recumbent bike we have talked about, making it ideal for users of even the most advanced fitness levels. The resistance is easily controlled with the LCD computer display for quick changes. The magnetic resistance featured on the Exerpeutic 4000 Magnetic Recumbent Bike is very constant, smooth, and quiet, plus it experiences limited wear and tear. All in all, this recumbent bike comes with an excellent resistance system. Another thing that we really like about the Exerpeutic 4000 Magnetic Recumbent Bike is that it has been built for comfort. The air soft seat which this model features is a full 3.5 inches thick and has multiple separate cells and air chambers. This means that it is one of the most well-padded recumbent bike seats around. Even better is that both the seat and backrest are ergonomically designed to be anatomically correct, which translates to a whole lot of comfort. The special air cells which are featured in the seat bottom and back rest are both great for ventilation. You can use the Exerpeutic 4000 Magnetic Recumbent Bike for hours without your back or bottom getting too hot. Even better is that the seat also comes with arm/elbow rests for more comfort than ever before. Of course, we cannot forget that the seat is also adjustable in order to fit users of various sizes. There is also the fact that the Exerpeutic 4000 Magnetic Recumbent Bike comes with oversized pedals that feature good grip and straps. All in all, the Exerpeutic 4000 Magnetic Recumbent Bike is one of the most comfortable home recumbent bikes that you could have. Yet another thing that we really like about the Exerpeutic 4000 Magnetic Recumbent Bike is that it has a great LCD display and an awesome computer system too. It comes with a really nice backlit LCD display that is easy to read in pretty much any circumstance. The display is also very easy to navigate, plus it displays all of the essentials such as speed, time, RPM, distance, calories, and much more. The computer is actually programmable for 12 different modes, plus there are 7 different training modes included as well. The combination of preset modes and the programmable function help you to achieve your fitness goals with ease. 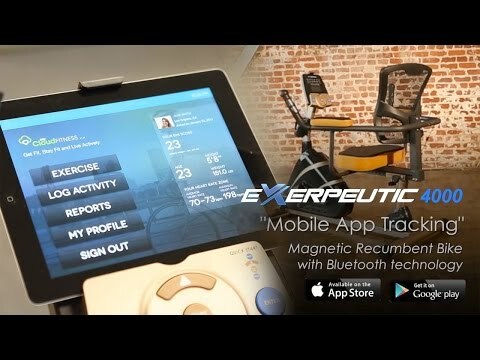 Even better is that the Exerpeutic 4000 Magnetic Recumbent Bike’s computer features Bluetooth connectivity so you can export your data to smart devices. As well, you can connect to the specialized mobile tracking app so you can keep tabs on your daily progress. It even has a great media tray so you can use your phone or tablet while biking. Finally, we also like how the Exerpeutic 4000 Magnetic Recumbent Bike features an extra strong steel frame with an extended weight capacity of 325 pounds, which should be more than enough for most users. The leg stabilizers featured on this model help to keep the Exerpeutic 4000 Magnetic Recumbent Bike stable even on uneven surfaces. There is also the fact that the frame is a step in model, which makes mounting and dismounting very easy. There are a couple of minor issues with the Exerpeutic 4000 Magnetic Recumbent Bike that are worth mentioning. We don’t like how the Exerpeutic 4000 Magnetic Recumbent Bike only comes with a 1-year limited warranty. For an item that costs as much as this one does, we would expect a little more from it. For the price that the Exerpeutic 4000 Magnetic Recumbent Bike costs, we would have liked to see an easier seat adjustment process. You need 3 separate knobs to adjust the seat, which seems a little complicated. To give you a bit of a reference point so you know what you are getting into, let’s look at a couple of alternatives to the Exerpeutic 4000 Magnetic Recumbent Bike. The 900XL is substantially cheaper than the Exerpeutic 4000, but that is for good reason. Simply speaking, the 900XL sacrifices some function, quality, and comfort due to its lower price tag. The Exerpeutic 4000 has a 325-pound weight capacity, whereas the Exerpeutic 900XL only has a 300-pound capacity. Moreover, while the 900XL does have 8 levels of manually controlled resistance, the Exerpeutic 4000 has 24 levels of digitally controlled resistance. There is also the fact that the Exerpeutic 4000 has a much more comfortable feel, which is thanks to the large and ergonomically designed air soft seat that it features, plus the great elbow rests too. The Exerpeutic 4000 also has a better functioning display with many more programs, plus it is Bluetooth friendly as well. This model by Exerpeutic is kind of like the middle ground between the Exerpeutic 900XL and the Exerpeutic 4000, which is also reflected in the price tag. The Exerpeutic 2000 has 8 levels of magnetic tension that is digitally controlled, plus 6 workout programs too. The Exerpeutic 4000 has way more resistance levels and many more workout options. Also, the 4000 has better fitness tracking abilities than the 2000, which is mainly thanks to the high-quality LCD display, Bluetooth connectivity, and awesome fitness tracking apps. What can be said is that both of these models have an awesome air soft seat that is designed for comfort. The Exerpeutic 4000 Magnetic Recumbent Bike is an awesome choice to go with. Even though it is a mid-range model, it has a whole lot of comfort, lots of features, and a great design. We would say that the Exerpeutic 4000 Magnetic Recumbent Bike is ideal for even the most advanced of cardio gurus. It’s comfy, strong, stable, and highly functional.